At high school, James Herbert Keenan wrote poems and illustrated them with a “small, wiry character” named Maynard. He adopted the name while he was in the army. He even made a ceramic Gene Simmons face at school, but his dad and stepmum worried Kiss was an acronym for ‘Knights in Satan’s Service’ and that Maynard was a degenerate. Failing to find steady work as an extra in Hollywood, Maynard turned to lessons. After Tool found fame, he took more classes ‘undercover’. David Fincher apparently expressed interest in casting him for The Panic Room. When Tom’s band Lock Up dissolved, he planned to form Rage Against The Machine. 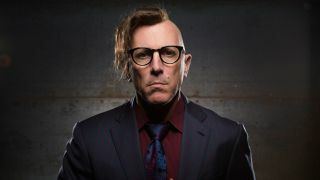 Maynard showed him the technique, and was briefly in the running to be the frontman. Maynard went to live at their communal loft, before performing on Three Little Pigs. It was also where Tool played their first gig, in celebration of Green Jelly’s record deal. He was surprised when an ex-girlfriend called to say she was pregnant, and worried he’d repeat the mistakes of his father. His son was born in 1995, and he welcomed a daughter two years ago. Long fascinated by spiritualism, Maynard went to a reservation and took part in a peyote ceremony, inside a teepee he helped build. The ritual lasted throughout the night.